Below is the promised translation of the Arctowski's famous observation in the Antarctic. Thanks for Frank Le Blancq for translating. In hard brackets are some clarifications by Frank. Translation of the whole double page of the book ( 1 ) where the observation appears is also available ( 2 ). "77 – The same day from 8 to 10am, Dobrowolski noted the parhelia, accompanied at 10am by a rainbow. At 11am he noted a halo. At midday : halo and rainbow. At 1pm and at 2pm : double halo. There was doubt about the cloud cover; thus at 8am we noted 4?, from 9am to midday 0?, at 1pm : 1?. Horizon misty. The morning a thin layer of low cloud, cirriform, moving quickly. In the afternoon at 1pm and 2pm the were some cirro-cumulus on the horizon. Temperature –13° at 8am, -9° from 11am to 2pm. Here is a note I took at 1130am : Light westerly breeze. A little blowing snow but not much. The atmosphere was full of crystals, which, carried by the wind, scintillated [sparkled] in the air giving the impression of an infinity of gold and silver threads. We found ourselves in cirrus ; we saw it better towards the horizon, where there was a clearer aspect of mist. The halo phenomenon showed itself in a more complete form than usual. 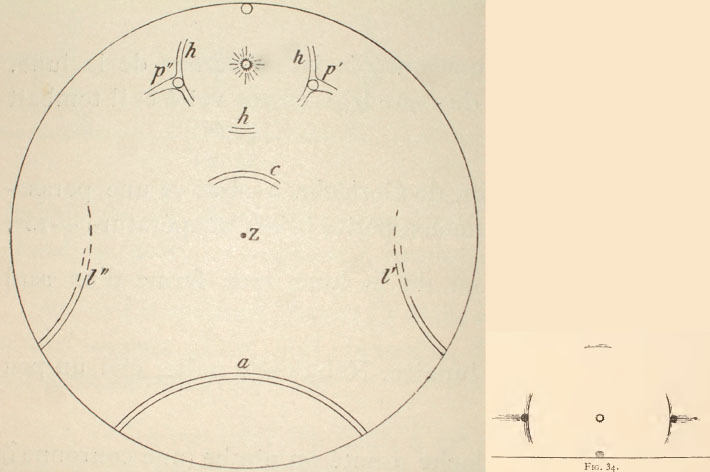 In figure 33 the outer circle represents the horizon, s the sun, z the zenith, h, h, h the fragments of the halo wth parhelia, p’, p’’ the fragments of the horizontal circle, a a rainbow as opposed to the halo, l’ and l’’ two fragments of the barely visible great arcs and finally c the arc of a circumzenithal circle. I measured the diametre of the halo h : 53° (radius 26° ; it is not therefore the normal halo). Distance from c to the zenith : 28 or 29°. The rainbow a covered 67° of the horizon and the base of the arcs l’ and l’’ we found about 30° from the extremities of arc a. 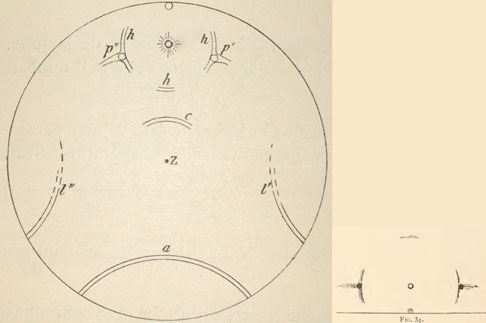 The parhelia were clearly marked [visible], the same as the image of the sun on the horizon which was very bright (figure 34). There was no cross nor aureole. The fragments of the horizontal circle were like the fading lateral trails from the parhelia. The fragment of the zenithal circle (reddish, becoming white on the inside) were very interesting for the observer. We saw effectively that there were clouds of crystals [i.e many crystals] blown by the wind. It became apparent a short distance aloft of the BELGICA, because we could clearly see the gusts of crystals which passed it. Moreover, against the ships crow’s nest [lookout point up the mast] the wind produced a swirl and there it formed a little whirlwind which had a coloured appearance and which, like the circumzenithal circle, produced a bright trail. So, these phenomena far from being moved away from the observer, projected themselves as if they were a long way in the sky, while in reality they were very close to us. At about 2.30pm there were again traces of the morning parhelia and, as the atmosphere contained fewer crystals, the solar halo was very beautiful due to its variety of colours : the red inside, then orange, then yellow, the green and blue were visible. However, the coloured band was very tight [close together]." Arctowski should not have started measuring anything and the display would be more normal. But it sound like they have indeed observed fogbow with halos, as also Dobrowolski had seen it earlier in the morning. In the book there are white rainbow descriptions from earlier days without halos. I don't really understand what they saw around the crow's nest. Some years ago I read Amundsen's Belgica Diary and I don't recall any major atmospheric observations there. Correct me If I'm wrong. After reading this post my first impression was that Arctowski observed a fogbow with supernumerary bows perhaps. The mystery that Arctowski observerd around the crow's nest could have been water vapor effect that came from the kitchen of the ship or from engine. So the droplets got mixed up with the crystals and produced the trail. I gotta check the Amundsen diary again, what they exactly did on August 20th ?